There have been some screaming matches on Washington-bound flights between people coming for Trump’s inauguration versus the Women’s March the following day. 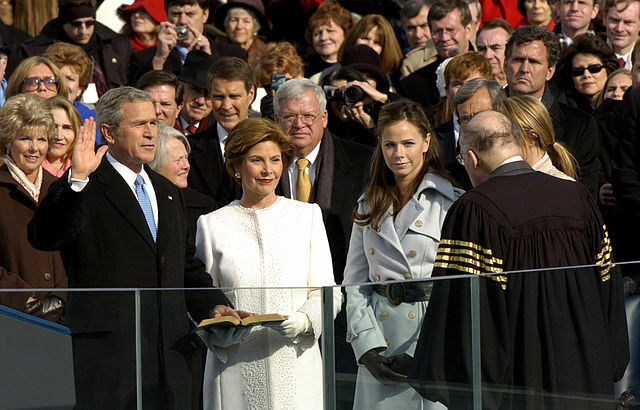 A dozen years ago, I saw – well, maybe sparked – similar fracases on a flight from Washington to Dallas, Texas, two days after Bush’s second inaugural speech whooped up forcibly spreading freedom & democracy all over the world. The flight was stockful of Texans returning after attending Bush celebrations. One dowdy looking lady loudly gushed to an acquaintance in the next row: “Laura looked so wonderful with that designer dress at the ball.” Her comment failed to fill me with remorse for not having been invited to that event. I was stuck in a middle seat between a chubby little 14-year-old boy and a tripwire-tense Air Force enlisted man. I smiled and said no, and asked if he had gone. His eyes lit up, his face awoke, and he declared, “Yes!” He told me he was from Bush’s hometown, Midland, Texas. “What did you think of the speech?” I asked. “Are you concerned about going to war to spread freedom?” I asked nonchalantly. The Air Force dude erupted, “Don’t listen to him! This guy hates America! This guy hates our president! Don’t listen to a single thing he says!” Maybe he didn’t like my beard. This guy – early to mid 30ish, with a borderline jarhead hair cut – was adamant that the Bush administration had never made any false statements on the road to war. “You people are going to proven all wrong next week!” he declaimed very fervently for someone practically sitting on my elbow. “Who is ‘you people’?” I asked. 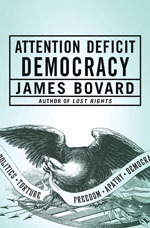 The Bush administration and the U.S. military were doing a full-scale propaganda push, touting upcoming parliamentary elections as vindication for the invasion. But the vote – which was largely a charade – merely accelerated Iraq’s descent into civil war. (I debunked that electoral fraud in a piece the following year for American Conservative.) The U.S. government had done everything possible to fix the election outcome except march Iraqis at gunpoint to the polls. In this Air Force guy’s defense – maybe he was edgy because he saw what I was editing on my flipdown tray – a couple printed out chapters for Attention Deficit Democracy. My hunch was that the torture chapter’s sardonic humor flew over his head. He gave me a blank look – “I don’t know” – followed by a slight grimace as if just maybe he should have a better answer. I nodded silently – this kid was definitely not in the league of Lyndon Johnson, another ambitious Texan. My answer did nothing to placate his suspicions. “What do you think the government should be doing? What is its main purpose?” I asked. That was the new American vision of freedom that Bush sought to impose around the world, so that boy was backing the right politician. H/t to Philip Crincoli Sr.
Will Trump’s Immigration Order Ban Congressmen from U.S.? Disappointing Mr. Bovard. I know there are lots of immature and inarticulate folks out there. Even some who are libertarians like me. Not to mention poorly educated children and extremist fruitcakes. They are not representative of thoughtful political views and should not be used as a basis for summarizing the nature of categories of people. It is unkind to those less thoughtful than you and there is plenty of appropriate evidence that some groups are populated by educated and shallow thinkers. No harm done, however. I see and hear this error being made all the time. I just think you are more persuasive when you pick targets more worthy of your skills. I thoroughly enjoy your work. You have been a pioneer for reason for many years and helped me start thinking about becoming a libertarian. Mr. Oglesby – thanks for your kind words on my previous work. I did not buttonhole those two on the street and nudge them to take a political literacy quiz. The fracas erupted not because I shouted that Bush was an evil dictator – it started because I calmly asked a question about bombing nations to spread freedom. From the moment the Air Force guy started referring to “you people,” he was fair game. And when the boy said he wanted to go into politics (but didn’t even know his congressman’s name) – ya, that made him fair game, too. Those two were representative of the widespread docility and righteousness in the U.S. before people recognized that George W. Bush had dragged the nation into a quagmire in Iraq. 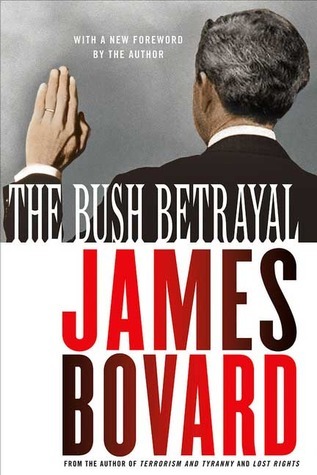 If you checked the LRC link to the denunciations of my book 2004 Bush Betrayal, that contains a bushel of examples of people equally or more enraged with any criticism of Bush. 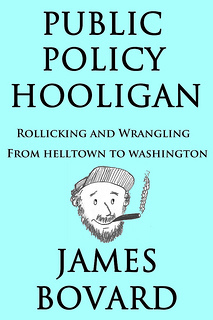 Perhaps some people who read the 2005 vignette will be reminded of people they encountered in that period who made similar claims and launched similar attacks on anyone who did not cheer the commander-in-chief. Unfortunately, we may see the same mindset become widespread again sooner than we expect. Why should I have to name my Congressthings before going into politics? That’d be like having to name the members of the Donner Party before going to Burger King…..
Lawhobbit, your fellow Beaver State residents will likely find your quip hilarious. Otherwise, not sure how many folks are familiar with the culinary record of the Donner crew. A sad comment on the educational system these days, that is. Of course, every year more and more of my cultural references go whizzing over the heads of my students, leaving them with puzzled looks and no greater insight into the topic.